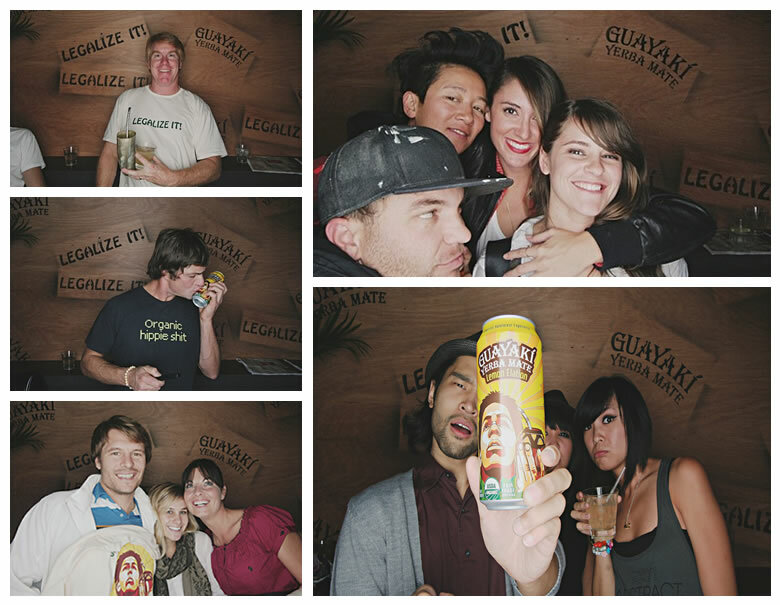 Guayaki had established itself as the #1 yerba mate brand in the US. They’d built a loyal following of former coffee-drinkers and gourd-passing hippies. But their latest product — mate in a 16-ounce can — demanded a new approach to branding and marketing. The canned drink was designed to captivate a new audience segment — the young male energy drink consumer — by eliminating some huge barriers: taste and convenience. In a market dominated by machismo, neither gentle peace-lovin’ coaxing nor brawn-throated exhortations would break through. What to do? egg launched the new product to a hipster demographic in an integrated campaign designed to capture the fleeting attention of our jaded and ADD target audience. We positioned the product as the new organic and healthy alternative to energy drinks, and the stimulant of choice for people alive to themselves and the world. In an integrated campaign laced with ironic humor and in-your-face camp, we took the brand from hippie to hipster at a rapid pace, outselling the control market by 700%. Guayaki's new product not only comes in a metal can, but tastes like a bright and subtle iced tea; the earthiness has been eliminated to meet the palates of neophobic Americans. Eliminating the taste and convenience barriers was crucial to the success of this new RTD. But there was still a major hurdle: how do you convince people that this isn’t just tea? Brands in this space can run the risk of seeming too earnest and turning people off. In the spirit of openness, we needed to speak in a different sort of voice than the strident activist “tree-hugger.” We also needed to be revolutionary in our approach, breaking through tired tropes of mass communication and doing something unexpected and experientially transformative. Our solution? 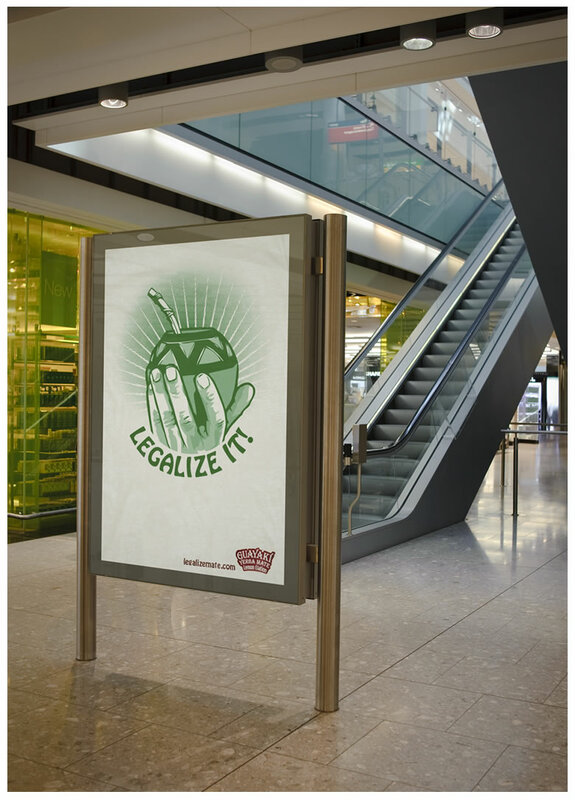 Legalize it! There’s little more attractive to this audience than the illicit. By implying illegality — all the while holding tongue firmly in cheek — we immediately get people’s attention, we get them very curious about this seemingly-magical new stimulant, and we begin to create culture around this new canned beverage while paying homage to the gourd (which, when paired with its special straw, a bombilla, looks a bit like drug culture paraphernalia). We launched the campaign using a test market strategy on a lean budget, with basic broad-brush reach and frequency elements like radio, and high-impact grassroots branding through cultural influencer events. We were able to leverage the radio relationship to promote the event beforehand (with on-air mentions and kitschily subversive flyers), and extend on-the-ground penetration afterwards in follow-up events. 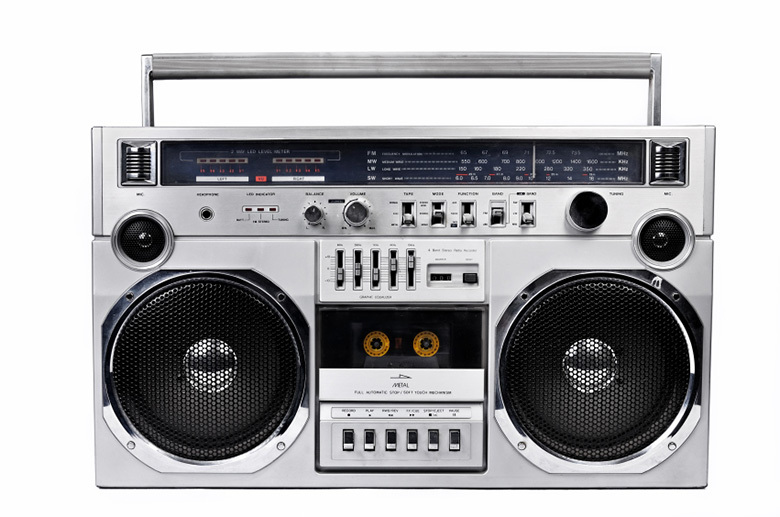 The radio spot exuded an arresting tribal/primal spirit and an on-brand revolutionary vibe. With its mythic storytelling and playful contrapuntal refrain, the spot played on two levels at once: deeply ironic and deeply serious. 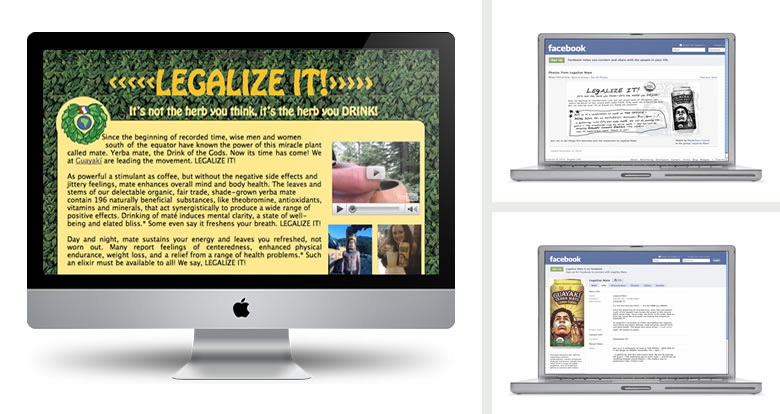 We unleashed supplementary engagement tactics such as a campy, ironic micro-web site and Facebook cause. 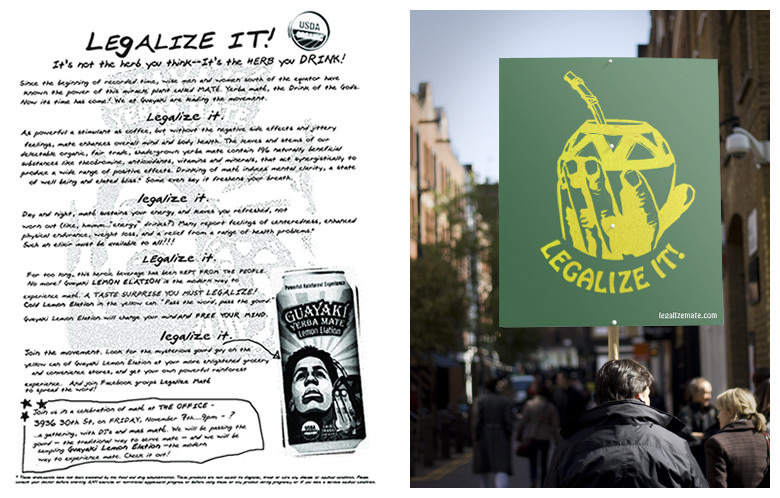 Using a visual language firmly rooted in drug culture to promote a legal beverage, all while promoting the brand's taste, provenance, and fair trade sourcing stories, we were able to capture the attention of our sensation-seeking target. Such a powerful plant must not be kept from the people! We used the influencer event as a strategic “cultural engineering” tactic designed to catalyze maximum cultural impact. Designed to attract the edgy hipster socialite elite, these “alternative” tastemakers then spread the good brand word to their many followers. Starting with a cool venue, we then booked hot up-and-coming DJs from LA, which allowed us to attract the hippest scenester hosts, who then invited their legions of socially aspirant followers to the invitation-only event through their social networks. The DJs we selected were already fans of yerba mate, and spoke to this throughout the evening. The branding of the event was handled subtly, so as not to turn off the jaded, branding-enured hipster. Atmospheric gobo lighting, projected rainforest/gourd imagery, custom drinks (with cans everywhere), and potted plants with storytelling inserts created the ambiance, and hundreds of goodie bags containing eco-friendly schwag, Guayaki products, and information extended the brand story post-event. A social-connected photo-booth was a key social engineering element. People crowded into the booth all night long — often spontaneously picking up cans of the new product as a prop — and immediately posted the images to social networks for all to see.